Everyone got quizzed by Santa. Usually if someone asks me what I want before a flight the answer is going to be something like, “The gift of no one kicking my seat back repeatedly during the flight” or “A free drink to get me through turbulence.” But a WestJet Santa Claus took it a few jolly steps further. 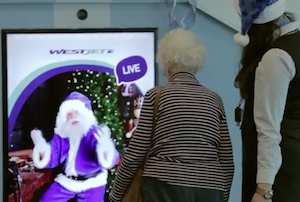 Passengers on two WestJet flights in Canada were asked to scan their boarding passes in front of a screen, which brought up a ho-ho-ho’ing Santa asking what they’d like for Christmas, reports CTV News. And while kids answered readily with things like “A choo-choo train” and “An Android tablet,” Santa queried adults as well. “A big TV,” said one couple. “Socks and underwear,” said another man. Then, while the flights were in the air, the discount airline’s staff went to work, scrambling to stores to shop for all the presents they’d taken notes on during the Santa interviews. Upon landing — ta da! Christmas dreams come true at the baggage carousel, where fliers were surprised with their personalized gifts. Is this a great way for WestJet to get some nice publicity? Sure it is, but it’s also kind of awesome. Anyone who says they wouldn’t be excited if this happened to them is a Christmas liar. And we know which list you’re on anyway.